Just because The Cheesecake Factory has this Tuscan Chicken on their Skinnylicious menu, it is loaded with so many fresh, Mediterranean flavors you will not miss all of the extra calories. 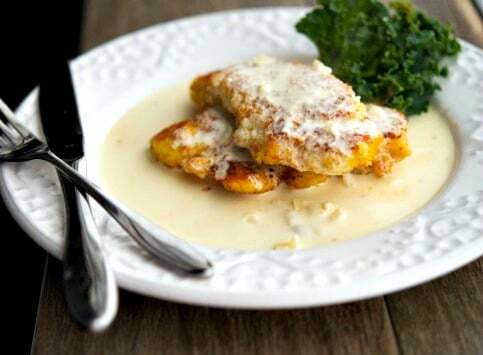 Learn how to make this popular restaurant entree at home. As you can probably tell by now, I’m partial to certain restaurant chains; mainly due to their proximity. The Cheesecake Factory is one of them; though the closest chain is about 30 minutes from where I live in New Jersey so we don’t go there very often. 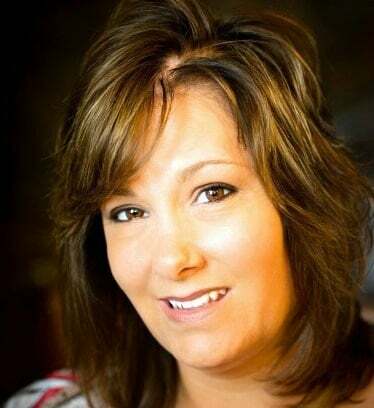 Oddly enough, the last few times we have eaten at that particular restaurant was when we were vacationing in Florida and I ordered Tuscan Chicken off of their Skinnylicious menu. Tuscan Chicken is grilled chicken topped with tomatoes, artichokes, capers and basil; then placed on top of farro and served with a vegetable (usually asparagus). I couldn’t wait to try to replicate this recipe myself. The grilled chicken was extremely moist on it’s own, but add the marinated vegetables on top of it and this chicken was fantastic! 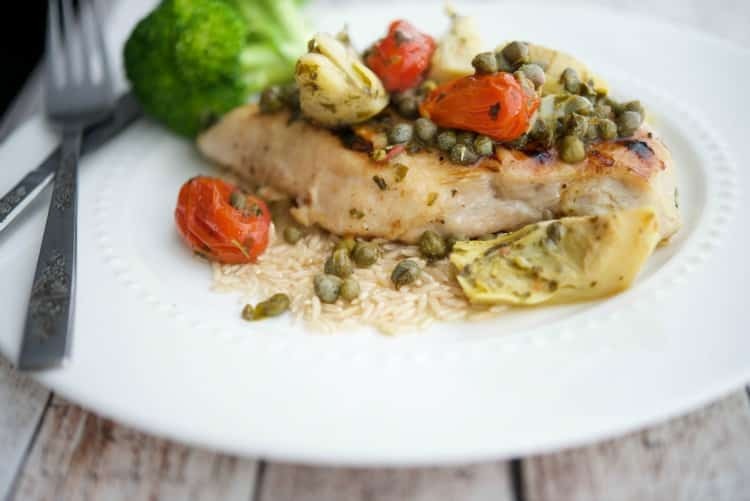 For this recipe, you will need boneless chicken breasts, grape tomatoes, marinated artichoke hearts, capers, and fresh basil. The Cheesecake Factory serves their Tuscan Chicken over farro, but I improvised and used brown rice instead because I had that in my pantry. Grilled chicken can sometimes be a little dry so I started off by marinating the chicken for 2 hours in a brine of water, sugar and Kosher salt. This really helps to keep moisture in the meat and once grilled, the chicken maintained it’s juicy flavor. While the chicken was marinating, I combined Italian marinated artichokes (with the juice), grape tomatoes, capers and basil. I wanted the tomatoes to take on the tart flavor of the artichokes. You can brine the chicken and the vegetables up to 24 hours so you can do this step the night before you’re ready to serve. In a small bowl, combine the water, sugar and salt and mix until it dissolves. Add your chicken to a resealable plastic bag; then add the liquid. Refrigerate for at least 2 hours. Combine the tomatoes, full jar of artichoke hearts and liquid, vinegar, capers and basil in a small bowl. Cover and allow to marinate for 2 hours (just like the chicken). Preheat your oven to 425 degrees F and heat your grill or grill pan. 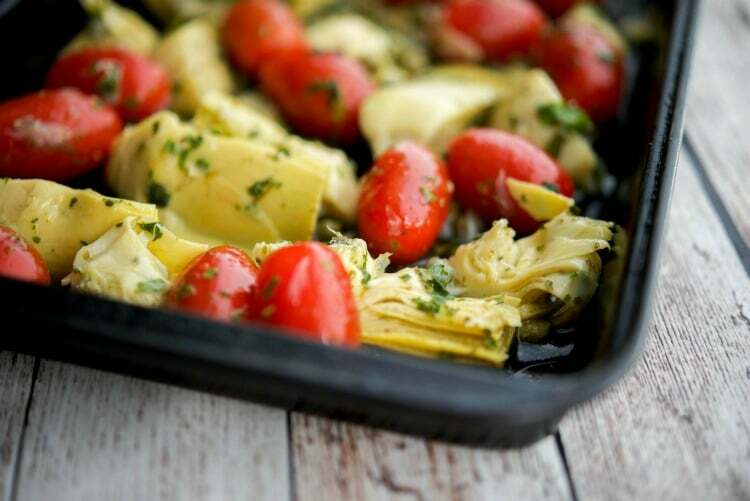 Place the vegetables on a baking sheet and roast for about 20 minutes or until the tomatoes blister and start to burst. Prepare a vegetable; then the farro or rice according to package directions. Next, grill your chicken until the internal temperature reaches a minimum of 165 degrees F. This can take approximately 8-12 minutes depending on the thickness of the chicken breast. 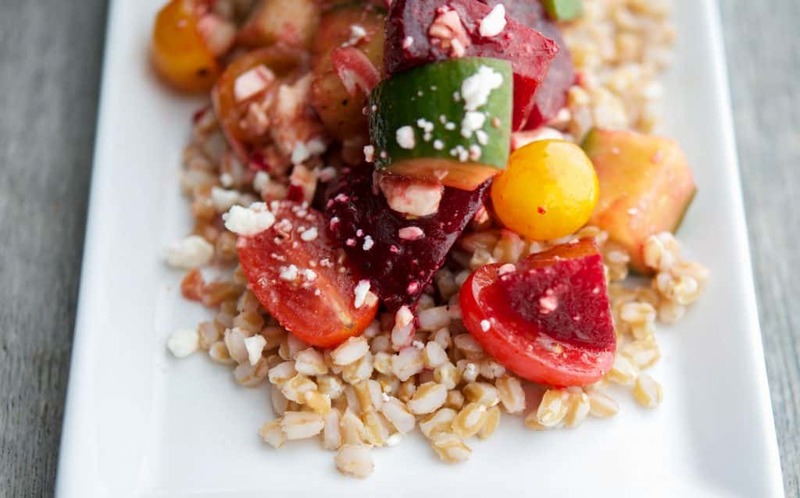 Place your farro (or rice) on a dinner plate, then the chicken; then top with a spoonful of the roasted vegetables. This Tuscan Chicken was delicious and tasted exactly like the restaurant version. 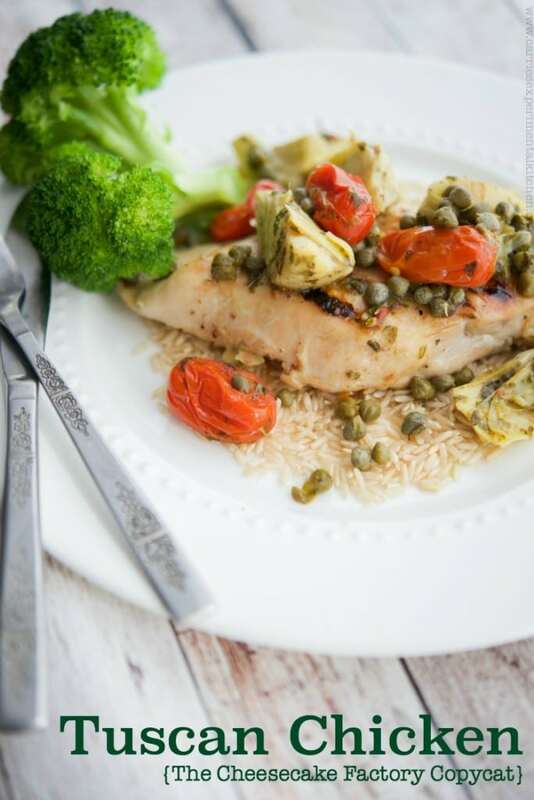 Trust me when I tell you that even though they call it “Skinnylicious”, it has so many Mediterranean flavors with the combination of lemony capers, tart marinated artichoke hearts and sweet grape tomatoes, you would never know this recipe is a healthier option than most. ~Enjoy! Preheat your oven to 425 degrees F and heat your grill or grill pan. Place the vegetables and all liquid on a baking sheet and roast for about 20 minutes or until the tomatoes blister and start to burst. *Nutritional information is based on specific ingredients and products used in this recipe and was calculated by MyFitnessPal.com; which may not be 100% accurate. The brine is not factored into this recipe as it's discarded before cooking. Visit the recipe index to search for more recipes by category! It definitely is Gabriela. Thank you for stopping by. This sounds great! I can’t wait to try it. You don’t say how much sugar, salt & water you used in your brine. Thanks for sharing this. Hi Jude, I’m so sorry about that. I’ve adjusted the recipe so it’s correct now. For this brine I used 2 cups of water and equal parts of sugar and kosher salt (1/4 cup). Thank you for catching my error and I hope you enjoy it as much as we did! I love this recipe in the restaurant and so thankful for a copycat version. I remember there was a lot of balsamic vinegar in this dish though, and your recipe doesn’t call for it. Wondering about that? Hi Kirsten and you’re absolutely right about the balsamic. I forgot to include balsamic vinegar to the recipe card. I’ve adjusted it now, thank you so much for catching my error! You added the balsamic to the ingredients list, but I’m not sure what to do with it? Drizzle it over the finished dish? Thanks! Oh, never mind. I see it now! Duh! Sorry. No worries!!! I hope you enjoy it! Didn’t think it tasted the same. I think the type or brand of balsamic vinegar makes it taste different. Nice try but not the same. This looks lovely and sounds delicious, but what is the sodium content per serving? I imagine that it’s pretty high. My mom lives with us, and she needs to watch her sodium intake. Hi Angelina, I just added the nutritional information to the recipe card. According to My Fitness Pal, this recipe has 496g Sodium; but the brine was not factored in since it’s discarded so it may be a bit more. I hope that helps! Does the brine get rinsed off the chicken. 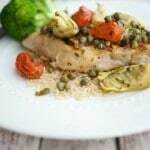 Its tastes identical to the CheeseCake Tuscany Chicken entree. Hi Carrie, thanks for this recipe. Going to try it this weekend. I’m on Weight Watchers and was wondering if you factored in the Farro into the nutritional information you included. I need to know so I can use the nutritional information to calculate points. Thanks so much. Hi Patricia, I hope you like the recipe! No, I did not factor in the farro with the calorie counts. Good luck on Weight Watchers and Happy New Year!